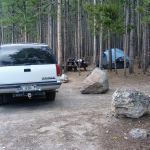 Canyon Village Campground is located within a mile of the Grand Canyon of the Yellowstone, and is one of the most popular campgrounds. 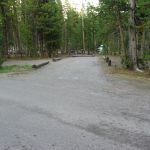 The Canyon Campground is a favorite due to its wooded setting and relatively central location within Yellowstone Park. There are several ways to access the Grand Canyon from the campground. The North Rim Drive provides turnouts and several overlook access points as well as a few views of the stunning Lower Falls. Along the south rim, Artist’s Point overlook and Uncle Tom’s Trail are two other popular points of interest for views of the canyon and waterfalls. 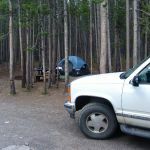 There are no electricity, water, or sewer hook ups at any of the campsites. RVs up to 40 feet long may be accommodated in pull-through and back-in sites. 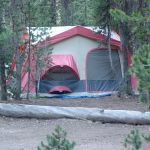 The sites may not be level, so campers should plan accordingly. 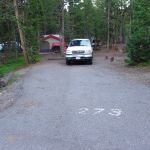 While there are no utility hook-ups at the sites, an RV dump station is available in the campground. 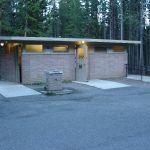 The dump station may not be available early and late season due to freezing temperatures. 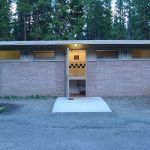 Pay showers and coin laundry are available at the Camper Services facility. 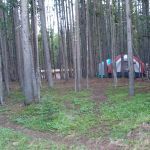 Rates for this campground include 2 showers per night. 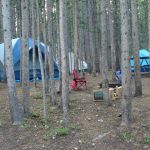 The campground is located within one-quarter mile of the Canyon Village, a visitor facility that includes lodges, a full service restaurant, cafeteria, snack shop/deli, gift shop, general store with groceries, gas station and post office. The National Park Service offers a new state-of-the-art Visitor Education Center and amphitheater with exhibits and Ranger programs available.